Yosemite in autumn is most notable for the absence of two things: raging waterfalls and raging crowds. If you don't mind the former, you'll certainly appreciate the latter. Those famous Yosemite Valley crowds start thinning out after Labor Day and don't recover again until the following May. When's the best time in autumn to visit Yosemite? September and October have the edge over November. The Tioga Pass and Glacier Point roads have usually closed by early November, which will severely cut down the amount of the park that you can explore. And although there's enough snow to close those roads, there's not enough to make winter sports feasible yet - you usually can't ski/board at Badger Pass or cross-country ski along the Glacier Point Road until December or sometimes January. What's good and bad about Yosemite in the autumn? Waterfalls: mostly just trickles by this point. Yosemite Falls often dries up altogether in the Fall. Bridalveil is barely flowing. Vernal and Nevada Falls, the highlights of the Mist Trail, are fed by the Merced River rather than the creeks that feed Yosemite and Bridalveil, so they'll have a stronger flow. They can still be rather subdued if there was a light snowpack the previous winter, though. If spectacular waterfalls are your goal, visit Yosemite in the spring. Yosemite Valley: You won't find rushing waterfalls or green meadows here in the autumn, but Yosemite Valley is still beautiful, and far less crowded than during the summer. 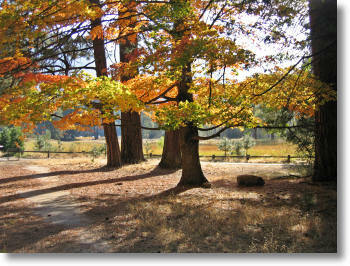 Yosemite Valley has lots of deciduous trees that start turning colors in the Autumn. It's a great time for strolling or riding bikes around the valley. Meadows: The great meadows of Yosemite have turned brown by autumn, and the wildflowers are long gone. Still, this austerity has a beauty of its own that's worth experiencing, and mosquitoes are far less prevalent. Lakes: Those beautiful granite-rimmed Sierra lakes, such as Tenaya Lake, May Lake, and Elizabeth Lake, are impressive in the Fall, too. Most of these are along the Tioga Pass Road, which usually closes by early November. Giant Sequoias: These ancient evergreens are equally pretty any time of year. Fall is a good time to see the sequoia groves without beng buffeted by crowds. Note that once the snow starts falling, the park service usually closes the Mariposa Grove road to automobiles, so you'll have a two-mile hike to reach the grove. Fall Color: Yosemite Valley and the Wawona Meadows areas are good spots to find Fall color, typically starting in October. Higher elevations in Yosemite tend to be occupied primarily by evergreens. Road Conditions: Bring tire chains if you're visiting Yosemite in the autumn, though you might end up not needing them. If you're uncomfortable driving on slippery roads, you best option is to enter Yosemite from Highway 140, which goes through Mariposa and El Portal. Since it approaches Yosemite Valley heading upstream along the Merced River canyon, Yosemite Valley, at 4,000 feet (1,200 meters) is the highest point you'll reach along the drive. The other routes to Yosemite Valley all go over passes of at least 6,000 feet (1,800 meters), and the Tioga Pass road reaches just shy of 10,000 feet (3,000 meters). What to Pack: You can encounter a variety of weather in Yosemite in the Fall, so pack accordingly. You might find Indian Summer conditions and wear shorts in Yosemite Valley, or sub-freezing temperatures along the high-country trails. If you're camping, bring a warm sleeping bag.